This morning as you step into the week 35 of your pregnancy, you are almost done with 8 months and are about to step into the last and most awaited month of your journey. The ninth and final month is the most crucial as you need to take most care and also watch out for signs and symptoms of onset of labor. At 35 weeks pregnant, your baby is 18 inches tall and is as big as a pineapple. Yes pick up this fruit when you are at the supermarket! The weight is around 2-2.5 kg. From this week on the baby will concentrate more on weight gain as he/she has already attained the standard height of a new born. The look of your baby at 35 weeks pregnant is almost like it will be at the time of birth. All external features are well formed by now and hair has received its pigment. The eyes open and close like yours and mine. The mouth and lips move and the little face can even grimace and make cute little expressions. This week the lungs are almost completely formed and ready to receive the first gush of air that the baby will take in with its cry. The first cry is a sound that will sound music to your ears at that moment. It signifies the successful completion of your pregnancy. The skull and bones are almost formed. The skull bones do not fuse as the brain development is still going on and also to allow the baby to pass through the birth canal with ease. The liver is able to process waste products and the kidneys are filtering urine. By this week, all the vital organs are functioning in sync with each other as they prepare the little one’s body for survival outside the womb. The baby continues to put on weight as he gets all ready for independent survival. The weight gain can be anything from one to several pounds a week. All babies tend to lose some weight immediately after birth approximately 200-400 grams. But they gain this weight back by the end of their first month. The baby is most likely to adopt the head down position by now in preparation for birth. There are cases where the baby is breech (bottoms down) or transverse (horizontal) in presentation. 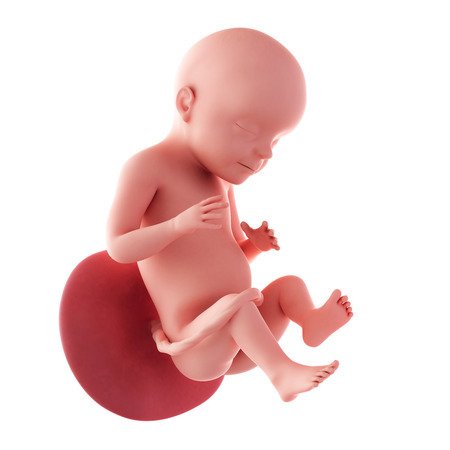 The baby’s position can be changed from the outside by a procedure called external version by applying pressure to certain areas. This process has a 65% success rate and needs to be done by a medical practitioner only. Symptoms like morning sickness and other early pregnancy symptoms are now a thing of the past for you. At 35 weeks pregnant, you are more worried with false labor pains and swollen feet. Your sleep may be disturbed because of the heartburn and backaches but this scanty sleep will help you prepare for the new arrival. After the baby is here, your sleep cycle is bound to change till he/she is able to fall into routine which takes a good few months. You will continue to gain weight this week and the upper edge of the uterus is now 6 inches above the belly button causing some serious crowding in the upper abdomen. You may feel the pressure in your rib cage of difficulty in breathing. The baby’s movements will get lesser from this week onwards. The space within the uterus is very limited so the nudges and pokes will be sharper. You should keep a mental check on the number of movements per day. The growing uterus puts pressure on the urinary bladder. Due to this you may experience leaking of urine on coughing or sneezing. Remember the irritating symptom you felt when you were 10 weeks pregnant or 11 weeks pregnant. It is back too- the urgency and I must go now feeling. These symptoms are temporary and likely to go away after the delivery is over. Pregnancy symptoms this week are similar to those of last week. The skin is stretching a lot so it’s very common to have itchy and dry skin. PUPPP is Pruritic, Urticarial, Papules and Plaques of pregnancy. It is a benign rash which occurs during pregnancy. Many pregnant women notice itchy, bumpy rashes on their abdomen towards the last few weeks. These rashes are extremely itchy but harmless otherwise and do not cause any problems to the baby. They are also self limiting. This week the 35 weeks pregnant ultrasound will show the baby behaving more like a newborn, exhibiting fine movements like sucking the thumb, rubbing his eyes or opening and closing the fist. In case you have been recommended for the procedure called external version, that is changing the baby’s position from breech to vertex, it may be done under ultrasound guidance. Between 34 weeks pregnant to 36 weeks pregnant, your doctor will order a Group B streptococcus test in the form of a rectal or vaginal smear. This is mainly done as there is a risk of passing on the bacteria to your baby at the time of birth. In the newborn, it can lead to infections like meningitis or pneumonia. In case you test positive, you will receive appropriate medication after you go into labor to prevent the baby from getting the infection. Avoid drinking too much of tea and coffee as they can aggravate the acidity and also have a diuretic effect – increasing the urine output. Include foods rich in DHA in your diet like salmon, walnuts, fish oils etc as they are very essential for good brain development of the baby. Get your birth plan ready and inform your partner about the same. Also discuss with your doctor, the pain medications, chances of a c-section and any other concerns you may have. Keep your hospital bag ready as you may need it handy anytime after you are 36 weeks pregnant. Do your kegels exercises regularly as they help you to strengthen the pelvic floor muscles and prepare for labor. Practice breathing techniques – long inhalation, hold your breath for a few seconds and complete exhalation. These will come very useful during active labor when you will be pushing with all your might. Have plenty of fluids, and water. Keep your feet elevated at night using a pillow. It helps to reduce the swelling and also helps you sleep better.